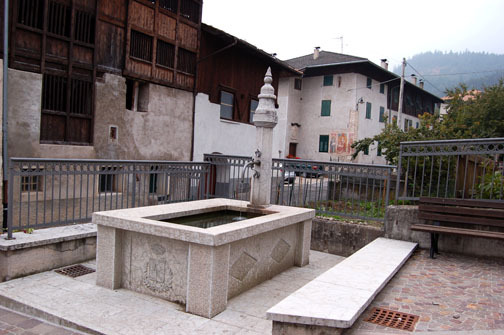 View of the town’s fountain with the Genetti home in the background. Look for this landmark while you are walking around Castelfondo using Google Earth. If you find genealogy a tad on the dry side, here’s a tech tip that will make it a whole lot more interesting. Why not take a walk through your ancestral village using Google Earth! This is SO cool! You can be transported directly to a town in Europe (or anywhere else!) without leaving your home. I spend hours on Google Earth exploring places I’m going to visit on my next trip. So let’s zero in on Castelfondo, the ancestral village of the Genetti family and see what we can find. If you haven’t already played with Google Earth, you will first need to download the basic software from the site. Go to https://earth.google.com. It’s free and only takes a few minutes to load. After you finish downloading you’ll see an icon on your desktop that looks like a blue marble with white swirls. Click on the icon and you are ready to explore! Let’s get started. In the upper left corner you’ll see a search box. Type in Castelfondo, Trentino, Italy and hit the search button. In an instant you’ll be whisked to a small village in the Italian Alps. From this perspective you will see an aerial view of Castelfondo, the surrounding countryside and nearby villages. Zoom in using the “plus” sign found on the right side of the screen. Or for a lot more fun, grab the little orange man located on the right and drag him into the village. Now you are at street level and can take a stroll through town. Yes, really! You can walk the very streets your ancestors called home, all from the comfort of your desktop! If you click and hold on the little orange man before you move him into town, you’ll see blue lines pop up on the screen. This tells you where you can and cannot walk. Once you are moving around town, just click on the yellow line to move forward. You can also click on the left or right of the screen to turn around and take in the surrounding view. To return to the aerial view, just toggle the button marked “Exit Street View” found in the upper right of the screen. Of course, you won’t be able to adventure down every street, but you can maneuver around most of the town and see quite a few sites. Here are a few landmarks to look for: the castle on the edge of town (only seen from the aerial view), the town bar (right over the bridge and on the left side of the stream that runs through town), San Nicolo Church, the town’s central fountain, the village grocery store, apple orchards and vineyards that surround the town and Amici di Castelfondo (the local cultural and historical society). If you find the town fountain, look just beyond it and you will spy the Genetti homestead. Unfortunately you can’t walk right up to the house, but you can see the fresco that is displayed on the side of the home. Have fun with Google Earth and happy exploring!